MICRON Corporation is the Medical Equipment Manufacturer. Cleans plaque and stain with powder jet stream. Recovers brilliant teeth quickly. More effective conduction of the subsonic vibration increased cleaning efficiency. The dedicated design makes best use of the characteristic features of its brushes. The newly developed slim and lightweight handpiece will reduce the strain on the hands during treatment. SA-100 is a newly developed handpiece in constant pursuit of ease-of-use in scaling. Simple, lightweight, and easy-to-grip SA-100 with its thin scaling tips make both users and patients feel comfortable during scaling at intraoral various sites. The common knowledge "Air scaler is noisy." is finally overcomed. SSS achieved a substantial reduction of characteristic running noise of air scaler. It is recommendable for doctors who have been avoided air scalers so far. The standard model of Micron's air scalers that offers powerful and effective tartar removal. Soft and powerful subsonic vibration delivers optimal efficiency and patient comfort. AW-100 efficiently enables root canal enlargement, shaping, and irrigation by generating powerful vibration (2,000-3,000Hz) for instruments. The power control function can adjust the vibration to suit instruments in use, or root canal shape. A multi-purpose air-driven handpiece for scaling and endodontic procedures. Canal Clean ensures quick irrigation of the root canal residues, suction and drying. Canal Clean offers easy and smooth endodontic treatment. 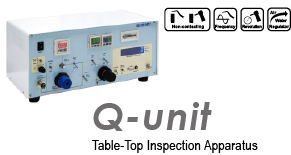 The compact and portable HPW-2 measures frequency and revolution with a single unit. Best to check performances of dental handpieces for manufacturers and repair companies. For use of dental manufacturers, repair companies, and laboratories, etc. Suitable for development, experiment, and product inspection of air-driven dental handpieces like turbines, motors, and air scalers. Copyright © MICRON Corporation. All rights reserved.